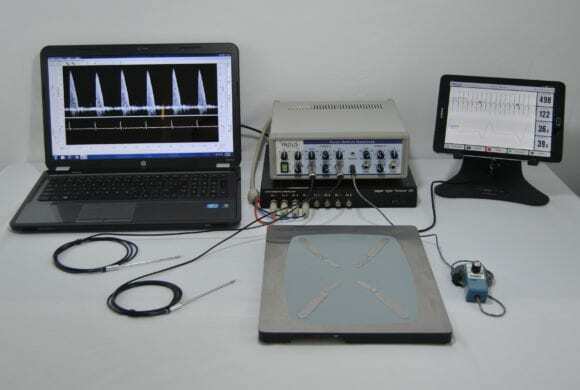 The Indus Doppler Flow Velocity system is used to noninvasively evaluate cardiovascular physiology and function primarily in anesthetized mice and rats. Investigators can serially follow changes that occur due to aging, disease progression, remodeling and the effects of surgical or pharmacological interventions. The system consists of four components: Pulsed Doppler Transceiver, Doppler Signal Digitizer, Doppler Workstation and Handheld Probe. 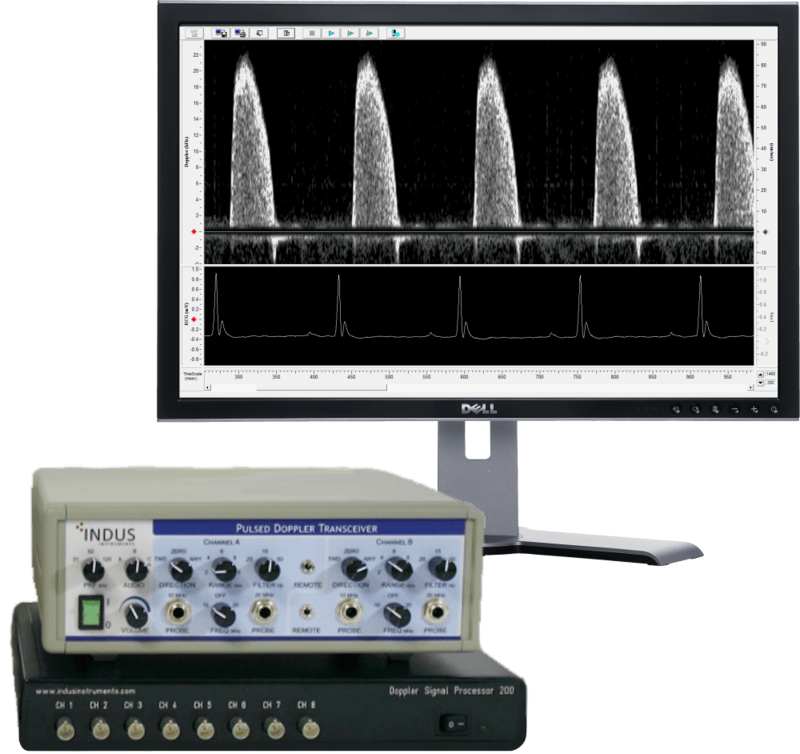 The Indus Doppler Flow Velocity System is a high-frequency, real-time pulsed Doppler measurement device with integrated data analysis software designed for measuring cardiovascular function in small animals. The high sampling rates grant excellent temporal resolution, making this the ideal system for studying fast heart rates and rapid blood accelerations present in small animals. Hardware components include the Pulsed Doppler Transceiver (PDT), a 10 & 20 MHz switchable dual channel system, Doppler Signal Digitizer (DSD) and Doppler Workstation (DW). Pulsed Doppler signals from the PDT are digitized at high sampling rates by the DSD and the workstation software. The acquired signals are processed using a fast Fourier transform algorithm and displayed as real-time grayscale Doppler flow velocity spectrograms. The workstation software permits recording and analysis of these spectrograms, ideal for report generation and publication purposes. This system has been successfully used in publications with mice, rats, bats, naked mole rats and other small animals. It is also capable of measuring blood flow velocities in larger animals using our implanted extra-vascular Doppler cuff probes. 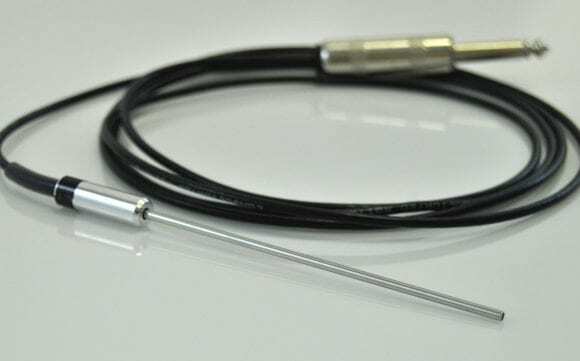 For most applications, a noninvasive rigid probe with an end-mounted transducer is required. The active element is a 1.0 mm diameter (10 or 20 MHz) piezoelectric crystal recess-mounted at the end of the probe using epoxy molded into a lens to focus the sound beam. This type of focused probe has been applied in mice and rats to measure cardiac and arterial blood velocity noninvasively. 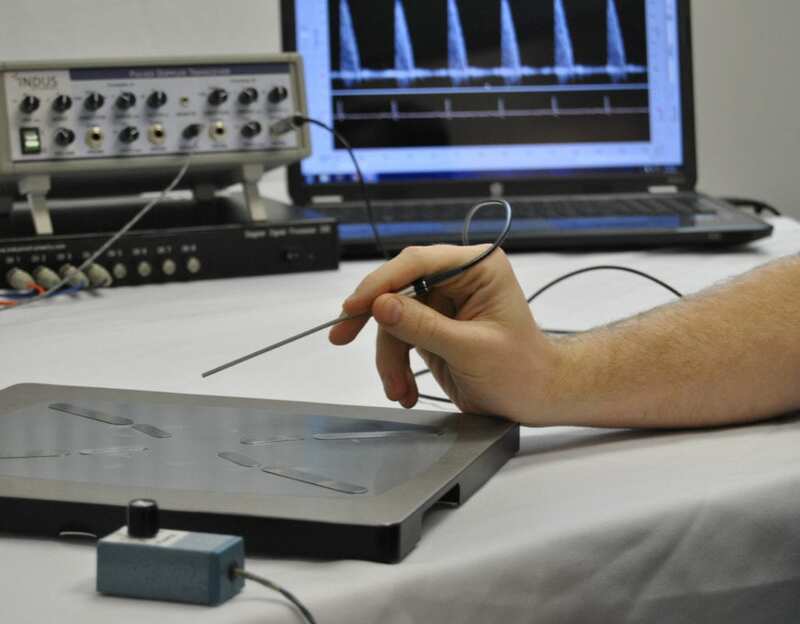 The probe can be held with a steady hand, or mounted in a micromanipulator which often assists with measurement accuracy and consistency. 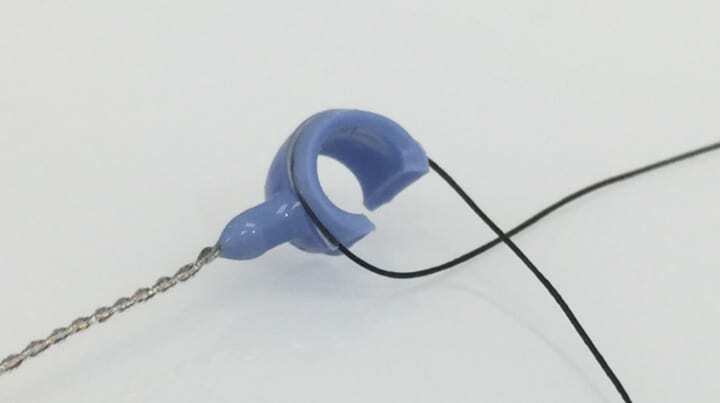 For chronic (implanted), extra-vascular applications or when the vessel cannot be accessed by a probe, a cuff transducer can be used. The cuff body is molded of flexible silicone and split lengthwise so that it can be slipped around the vessel. The piezoelectric crystal (10 or 20 MHz) is 1.0 mm diameter and mounted at a 45-degree angle using medical-grade epoxy. Doppler Flow Velocity System, including Doppler Workstation (left), Pulsed Doppler Transceiver (right top), Doppler Signal Digitizer (right bottom), Probes and Remote Range control. Addition of a Rodent Surgical Monitor provides integrated subject warming and ECG measurement. The 3Rs (Replacement, Reduction, and Refinement), introduced in 1959 by William Russell and Rex Burch and discussed more frequently in the past 15 years, serve as guidelines when designing experiments involving animals. The Doppler Flow Velocity System embraces these concepts in its design and everyday use. By collecting data serially, researchers are able to both gather more data and gain extra control over variability – Reducing the number of animals potentially required used per study. 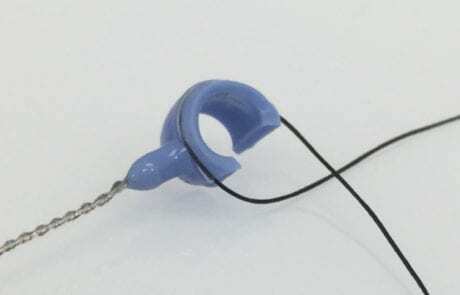 Refining catheter-based or other invasive measurements by using noninvasive handheld probes decreases unnecessary pain. Further, the small diameter of these probes allow measurements that would be difficult or impossible with systems with larger footprints.